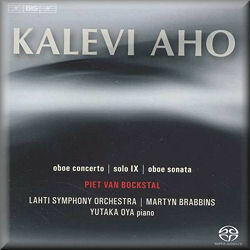 Not many new releases can boast ‘recorded in the presence of the composer’, but then the Aho/BIS/Lahti relationship has been a close one from the start. Fortunately Osmo Vänskä – the mainstay of this great project until he took up the musical directorship of the Minnesota Orchestra in 2003 – has been replaced by the equally talented and sympathetic John Storgårds. Now we have Martyn Brabbins, whose Proms recording of Havergal Brian’s ‘Gothic’ Symphony I applauded so vigorously last year (review). It’s always a pleasure to read Aho’s succinct liner-notes, but then he’s among that rare breed of plain-speaking, unpretentious contemporary composers who refuse to clothe their works in arcane musico-philosophical garb. he makes it clear that in the concerto he looks to Arab music for something ‘other’; this he achieves with the use of oboe d’amore, heckelphone, darabuka and djembe. The distinctive sounds and rhythmic patter of the latter – deployed to telling effect in the sinuous Presto – really do give the work an irresistibly exotic flavour. There’s a chamber-like intensity to this concerto – a heightened instrumental clarity if you will – and oboist Piet Van Bockstal is a gentle and evocative soloist throughout. The unfamiliar sounds that emanate from the rest of the orchestra – they’re hardly avant-garde, but they’d be outside the remit of most ensembles – are expertly pitched, and Brabbins ensures that focus and momentum are never lost. The fourth movement Cadenza in particular features ear-pricking calisthenics for the oboe; the self-effacing Van Bockstal is dextrous without seeming too flamboyant. Indeed, there’s a balance between style and content here, a delicate inner equilibrium, that one hears in Aho’s very best works. After that wide-ranging and eventful opener Solo IX, dedicated to Van Bockstal, is a thrilling display of the oboe’s expressive possibilities. Now ecstatic, now reflective, the writing – and playing – are never less than mesmeric. As for the recording, made in the familiar acoustic of Potton Hall, it’s exemplary in its timbral accuracy and sense of a living, breathing space. The oboist is placed at a sensible distance too, which gives the instrument a warm, unfettered loveliness that’s sure to win friends for this piece and its very capable dedicatee. The insistent repeated notes on the piano at the start of the Sonata herald a return to Aho’s more robust, attention-grabbing style of the 1980s. This is young man’s music, probing and not a little confrontational, but for all that it’s an assured work and – in the best sense of the word – it’s an accessible one too. Yutaka Oya’s alert, muscular pianism is very well caught, although some listeners may find the big, bold Steinway D overshadows the more backwardly placed oboist at times. Still, there’s much to enjoy here – the sudden lyrical flowering at the heart of the second movement for instance – and there are surprisingly jazzy, Milhaud-like passages as well. In fact, this piece strikes me as very Gallic, suave and sophisticated yet egalitarian in its appeal. Another fine addition to the Aho discography, which has grown in size and stature since my survey in 2008. There’s no sign of artistic atrophy – see also my review of Aho’s hugely potent Organ Symphony, written in 2007 – and yet again BIS have done this composer proud with a recording of disarming naturalness and presence. Fine music and musicianship, faithfully caught; what BIS does best.